With high levels of job satisfaction, it's also one of the most exciting industries there is. We have a long history of educating engineering professionals. With roots in London Council School of Building (1904), Brixton School of Building (1940) and the National College for Heating, Ventilating, Refrigeration and Fan Research (1948), we've been delivering professional engineering education for over 100 years. Specialising in civil and building services engineering allows engineers to utilise their talents in careers that develop complex systems, products and processes to solve useful and practical real-world problems, such as how to keep the underground cool in the most cost-efficient and effective way. The focus is very much kept on customer needs throughout the life cycle of design, testing, manufacturing, installation, operation, monitoring and future planning. All of our individual course entries have specialist careers information. Search our courses and download our Careers in Engineering Guide (PDF File 3,650 KB). Employers actively look for graduates with accredited degrees. You'll find that all of our degrees are accredited by or developed in partnership with all the leading professional accrediting bodies. These essential relationships allow our students to graduate with internationally and professionally recognised qualifications – vital for their future careers. Our graduates work in the design, construction and consulting sectors, as well as in maintenance and facilities management. From the very start of the building design, engineers are involved helping architects and other members of the design team to get the size, shape and configuration of the building right. They determine strategies for designing energy efficient buildings, making them sustainable in the long term. 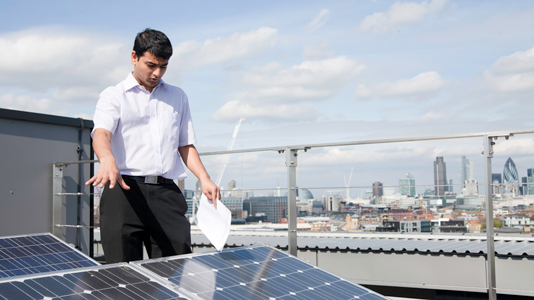 Find out more about careers in building service engineering. Through infrastructure projects, civil engineers make a difference to people's lives. They provide a water supply or road network, refurbish buildings, redevelop inner city areas or work on prestige projects like Crossrail. Graduates meet the diverse challenges of structural, highway and transportation, water, public health and geotechnical branches of civil engineering to make improvements and create solutions. Find out more about careers in civil engineering.